(Newser) – President Obama's environmental record is a "tremendous improvement" from the Bush-Cheney days, but he's on the verge of destroying it with the Keystone XL oil pipeline, writes Democratic congressman Raul Grijalva in the New York Times. The proposed pipeline is a perfect example of how such projects came to be in the bad old days, when politicians trotted out phrases like "streamlining" and the industry could "game the system" with huge infusions of money, writes the Arizona lawmaker. Could someone please tell me what positive environmental record or green legacy the Obama administration actually has? He has talked a good game during the campaigns, but so far I can't think of a single thing he has done after some initial government loan guarantees to start up alternative energy companies. He started out with immediate approval of the southern leg of Keystone XL without requiring any kind of environmental impact statement or public comment period. The Corps of Engineers has allowed the pipeline companies to fractionalize whole pipeline routes, as if they were very short distance projects, so that the pipeline companies could avoid having to do environmental impact studies even though the fractional segments form a single continuous pipeline that crosses multiple critical water supplies and environmentally sensitive areas. He initially campaigned that he would reject KXL if it had a large negative environmental impact, but then allowed the State Department under Hillary Clinton to retain an environmental consultant tied to the pipeline company to produce a positive impact analysis and did not require the resulting environmental impact analysis to be redone by someone independent after the biased study became public knowledge. Since last summer, he has reframed the basis for his decision from being whether or not KXL has significant negative environmental impact to instead base the decision on whether the pipeline has less of a negative impact than rail transport. He essentially accepts the TransCanada and oil industry argument that the Alberta tar sands extraction is a done deal and will continue with or without the pipeline. However, it is not a done deal. 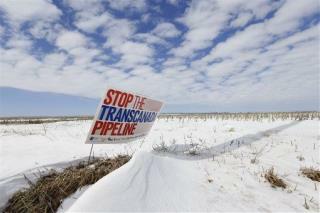 No pipeline means the economics for the tar sands extraction are not good. With no alternative transportation method having capacity equal to the pipeline, the tar sands extraction could well become not economically viable and would shut down or at least continue at a much lower level of activity. Obama's environmental legacy is much like his legacy on individual rights after pushing for a more punitive NDAA, elimination of other constitutional protections and increased secret surveillance under the guise of national security from terrorism, increased used of extrajudicial assassinations, and transparency and openness in government that has resulted in less openness and more prosecution/persecution of whistle blowers. He is all campaign promises and very little action on all these promises. The argument is fundamentally simpler. Why would you build an oil pipeline, that no expert, company or government entity can guarantee will not leak, over United States' greatest fresh water resource, The Ogallala Aquifer? Obama self-destructed long ago. Janet Napolitano was the head of Homeland Security when it purchased millions of dollars of worthless body scanners, which constituted legal strip searchers of airline passengers. From whom were these worthless machines purchased? From a company represented by Michael Chertoff--the former head of Homeland Security. Money and special interests rule, regardless of who lives in the White House.